Alisson Becker is adamant Liverpool have what it takes to compete on both fronts as they chase glory in the Premier League and the Champions League in the final quarter of 2018-19. Domestically, the Reds currently sit second in the table, one point behind leaders Manchester City with eight games left to contest in the division. However, the current focus of Jürgen Klopp’s men is on their European aspirations as they prepare to take on Bayern Munich in the second leg of the Champions League last-16 tie, with the aggregate scoreline finely poised at 0-0. 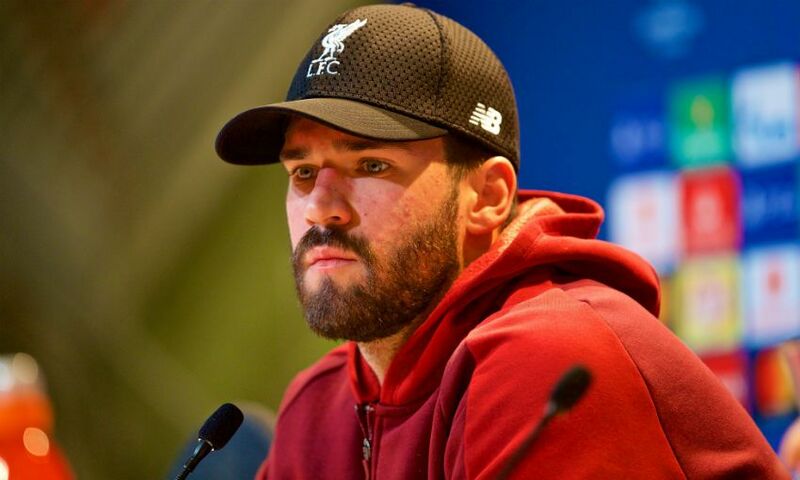 And Alisson insists Liverpool will not look to prioritise one competition over the other, maintaining they are aiming to go the distance in both tournaments. 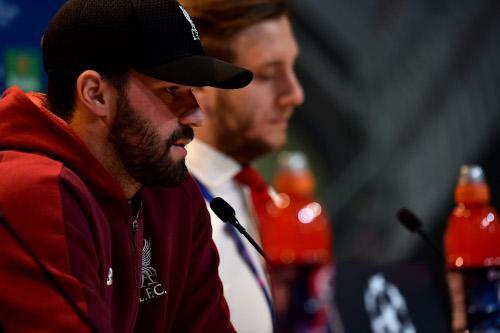 The Reds touched down in Germany on Tuesday afternoon and the Brazil goalkeeper tackled questions from journalists at a press conference at the Allianz Arena ahead of tomorrow night’s meeting with Bayern. It doesn’t change anything. We have our goals and we are fighting for them. Our goal is to win the league and everything we are playing in, [so] the Champions League as well. We are fighting in this period. This team is a great team. We are focused on this next game and it is a challenge for us. No, we can’t choose what we go for. If we can choose, but we choose both! They are two big competitions. Of course, in the Premier League it is a long time since Liverpool won it and they have never won the Premier League with this name, so we will fight for both. He is a funny guy, but on and off the pitch inside the time of work, he is pretty serious and a passionate guy for football. He puts this on us on the pitch; he gives his passion for me and my teammates in the games so this is very good. He is a funny guy because he is a great guy, a good guy. The way he deals with everyone, he treats us like his own sons. He treats everyone as equal in the dressing room, the staff, everyone, so this makes him a special person for us. I cannot compare myself with Neuer - he is one of the best in the last 10 years. Maybe he is the best one. He has won everything and I am just starting out. He is a reference for me and a great guy as well. Playing against him is a pleasure for me and a dream come true. I believe this is a consequence of what we do on the pitch. In the training ground every day I will work hard. I know have to work hard [because] I am part of a big club who have big plans and big goals. I need to take this responsibility and take care of it. For this, I need to give my best - my 100 per cent - on the pitch. To be the best in the world would be a consequence of this. It is great playing with him - and all my teammates. We have so many players with a lot of quality, but Van Dijk is a very, very important player for our team and the way he plays gives consistency for our team, defending high balls, corners, set-pieces. He is important for us and it is very important to have him [back] for this second game. I think Fabinho played well at centre-back [in the first leg], but it isn’t the same thing - he is a great midfielder and a good centre-back. If you can have the best in the position, for us it is always better. Like we prepare to meet every player. He is a great striker, maybe one of the best in the world. I like his style, I like the way he moves on the pitch, so we need to be very concentrated to stop him and try to stop the other players. I think it’ll be a great game and we will be prepared for it. We are prepared for the game and we know penalties can happen, so we will try to come back [to Liverpool] with the qualification for the next stage, but the way that goes I don’t know. So, we are prepared for everything tomorrow night.